G. K. Gilbert, photographed in 1898 in Washington, DC. Grove Karl Gilbert did not set out to be a geologist. He studied Greek and mathematics at the University of Rochester, and, upon graduation in 1862, taught school in Michigan. He was 19, hardly older than some of his students, and soon realized the job was simply too much for him. Before the school year was over he was back in Rochester, clerking at Cosmos Hall, a natural science center. He began to study fossils, rocks and minerals, and by 1867, he had learned enough about prehistoric geology to superintend the excavation of a mastodon fossil near Albany, New York. Reportedly, he "recoiled from the bones themselves and studied the pothole which had entrapped the beast." For the next three decades, Gilbert worked for the US Geological Survey, studying every aspect of the earth's crust. 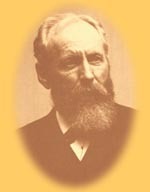 In the mid-1890s, he used a telescope to study the craters on the moon. He worked for a time in the Survey's Washington office, but he much preferred the field. At age 50 he wrote that "In the ten years of western mountain work and camp life I have spent enough time out of doors so as to be a very vigorous man." Vigorous, and messy. William Dall complained on one occasion that Gilbert "had made a perfect bear garden" of the office in Washington, DC, "without making any sign of apology or excuse." Even so, Gilbert was the top field geologist of his day, and an obvious choice for the scientific team on the Harriman Expedition. Gilbert used his time on the Elder to consider the physics of glacial geology and geomorphology. He camped out with John Muir, took many photographs, and set out to build a reliable set of data about Alaskan glaciers that would be useful in his own time and for years to come. He wrote a full volume about his findings, Glaciers and Glaciation. Today, it is considered the best scientific work to have come out of the expedition. In it, Gilbert analyzed the effects of climate, topography and motion on glaciers. He even drew a map of the Alaskan skyline as it had existed before and during the Ice Age. Gilbert said that it was "the natural ambition" of a geologist to want to feel an earthquake, and he actually regretted missing the great quake that shook Alaska in late 1899. But, in1906, he lived through the earthquake that struck San Francisco, and immediately joined the investigation team that looked into the geologic causes of the disaster. He spent months in north and central California, studying structural damage. In the end, he said, "Whatever the earthquake danger may be, it is a thing to be dealt with on the ground by skillful engineering, not by flight." G.K. Gilbert died in 1918.